Neither option is “better” than the other. 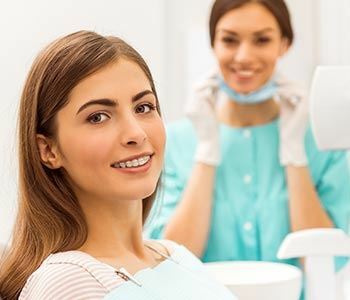 Both traditional braces and Invisalign have their place in dentistry, but we are finding that an increasing number of patients with minor to moderate alignment issues are turning to Invisalign. Invisalign, like all orthodontic treatments, works under the principle of applying constant yet gentle pressure to move teeth into the proper position. The clear aligner trays of Invisalign accomplish this a little differently from traditional braces. The aligner trays are custom designed to fit snugly on the teeth and gradually move them into alignment. With Invisalign, there is no need to tighten wires, instead, aligner trays are switched out every two weeks. Invisalign aligner trays are made of a comfortable plastic that is custom fitted to the arch of your teeth. While the aligner trays can feel a little snug when they are put on for the first time, there are no sharp brackets to irritate gum tissue or the inside of the mouth. Invisalign is a low-profile orthodontic treatment, which allows you to straighten your teeth discreetly. Patients who undergo Invisalign have a positive experience without feeling insecure about appearance. Invisalign trays are removable for the ultimate convenience. Patients no longer have an off-limit foods list. They simply remove the trays to eat and make sure to brush and floss prior to putting them back on. To learn more about Invisalign, call our team at (267) 463-2777 today.